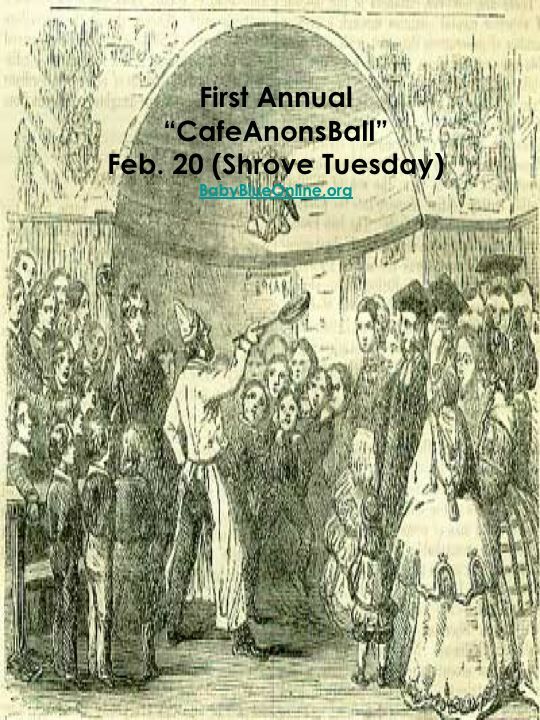 Welcome to the First Annual CafeAnonsBall! Here we are – it’s Shrove Tuesday. We have the beads and the tinfoil hats (haven’t donned any masks – we’ll leave that to Mr. Dylan) and the kettle’s on the boil while the pancakes are flying high! What we need is a little bit of music! You can click here or here (the earlier preview) to get started (two hours of music all together!). You can also subscribe to BabyBlueOnline’s podcast at iTunes and download to your iPod. PS – As a sign of goodwill, the first song of the evening here is dedicated to Jim Naughton – we discovered that, whatever else may happen, we will always have Harry Potter in common (not sure which “houses” we belong to though!). The second song is dedicated to, well – who do you think after this weekend? Who knew BabyBlue had this song in the repertoire? In fact, Jenny up at the ACN office and I used to sing it at church coffeehouses years ago – but we were so much younger then, we’re older than that now. More dedications coming! Sorry about Song #3 – but it ends with the audience booing Dylan – kind of know what that feels like these days. See how he handles all the booing – and take note! First up, we have an excellent recipe for pancakes – from Bill (thanks, Bill)! 1 3/4 cups of flour, sifted with good pinch of salt and 2 tsp. sugar. —> all into a bowl. Beat a mix of 2 eggs plus 1 egg yoke and add slowly to flour in bowl (obviously), stirring strenuously. Rest a little to prepare for next step, then beat with fork while you slowly add a mixture of 1 cup milk & 1 cup water. Beat until batter is bubbly on top. Stir in the grated rind of 1/2 lemon. Take a nap or have a drink while the batter stands in a cool place for at least an hour. (A little good quality brandy can replace an equal volume of water (strongly recommended). When ready to make pancakes, stir 3 teaspoons of melted butter into the mix. Heat a little oil in a medium sized pan. Swish oil around (half-way up sides), then pour excess hot oil into heat-proof bowl. Roll up sleeves, add small amount of batter and tilt pan around to spread the batter thin, VERY thin …. BUT no holes in sspread batter! Cook and shake pan to loosen as batter solidifies. Flip once (twice if you are trying to impress …. more and varied flips for the experienced such as the famous ‘over the shoulder flip’ or the ‘between the legs flip’ or ‘the forward hurl, then run and make a diving catch’ (this one always impresses! Serves 6, double or triple recipe for more. N.B. Stove at about medium, start a little higher, then reduce to medium if it’s too high. Pancake quality improves with experience. Add some of the reserved oil as needed to relubricate and then always pour off excess. We also have a suprise coming (which, when it’s ready, should appear below). It should please all on both sides of the aisle, as it were. We hear then folks (again, on both sides of the aisle) might be feeling rather cranky and so we just ask that tonight, on Shrove Tuesday, we just pull up chair, grab a mug of Butterbeer or BabyBlue’s Chai Latte’s, stack a pile of pancakes on the plate, sing along with the tunes, get up and dance (the wonders of the BabyBlueCafe is no one will see you – so go for it! ), or chat about what ever is on your mind by clicking on the “post a comment” on this posting. But whether you’d like to just find a little corner to yourself or be the life of the party – you are all welcome here tonight! LATER: See below this posting for the on-air interview of Kendall Harmon, Canon Theologian of the Diocese of South Carolina, and Susan Russell, President of Integrity. It’s an excellent interview all around – both Kendall and Susan articulate the division very well. We apologize that BabyBlue forgot she was recording and offers an unplanned verbal editorial at one point – sorry about that. For centuries, the English have celebratd Shrove Tuesday, the day before Lent, with merriment and antics and, especially, great quantities of pancakes. In fact, the fried flat cakes became so important to the holiday that is has also been called Pancake Day, or Pancake Tuesday. Long ago, strict Christian Lenten rules prohibited the eating of all dairy products, so keen housewives made pancakes to use up their supplies of eggs, milk, butter and other fats. They could be easily made and cooked in a skillet or on a griddle. Families ate stacks of them, and pancakes were popular with all classes. The rich Shrovetide pancakes were eaten as a ritual or symbol of self-indulgence before the fast. Early English recipes called for wheaten flour, eggs, butter or lard, a liquid (water, milk, ale or wine) and flavorings such as white or brown sugar, spices (nutmeg, cinnamon, or ginger), orange flower water, scented sugars or liqueurs. The pancakes were fried in butter or fat and served flat or rolled and sprinkled with powdered sugar, topped with preserves or doused with alcohol. A special pancake, called a quire or pancake of paper, was made very thin and usually stacked. It was likened to a quire of “wafers” or writing paper. EVEN MORE: Wonder what’s happening right now in New Orleans? Click here and see (this version is using Real Player). Oops Looks like we cut off a bit of U2’s “With or Without You” (ironic) from the CafeAnonBall music selections. Not sure if it’s the “with” or the “without.” Alas. We’d say, “so, sue me,” but we’d really rather you didn’t. THE LAST SONG FOR THE NIGHT: Here it is – just a few minutes to go before Ash Wednesday and so we offer one final song, a final dance, for the night. Of course, this being the “BabyBlue” Cafe, it just had to be a song from You Know Who. This is off his most recent album, the first one to go to #1 on the Billboard Charts in over 25 years, Modern Times. Rolling Stone Magazine named it the Album of the Year and it received the Grammy last week for the Best Americana/Folk Album (though it’s really the blues). What’s it about? Only Dylan knows for sure. But when we heard it here we could think of only one person who is with us at that moment “when the deal goes down.” There really is only person with us at that moment and the truth that He is with us, even at that moment, is extraordinary. Notice how Dylan doesn’t say “you’ll be with me when the deal goes down” ( which is what I think we often actually say) like in the 23rd Psalm – “Yea though I walk through the valley of the shadow of death, thou art with me.” Dylan – being Dylan – turns it around and says “I’ll be with You when the deal goes down.” And that is true. So here you are – last dance, last song, and we call it night. Thanks again from dropping in. We know that the coming months may be tough, they are uncertain and known only to God. But the prayer here tonight is that we will know for certain that He will be with us when the deal goes down. God bless you all – Happy Shrove Tuesday. Good night. This entry was posted in Anglican News, Bob Dylan, Harry Potter, Music and Arts, Podcasts, U2. Bookmark the permalink. The lion sleeps tonight? I hope Archbishop Akinola is getting some well deserved rest. God bless him! Blessings to all of you for Lent and thanks for the pancake history lesson bb. I have have this image of housewives all over England rushing around, making sure they had used up every egg, bit of butter, etc And we’re the happy recipients of that.